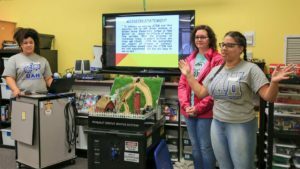 The Women in Defense Tennessee Valley Chapter sponsored two different STEM projects recently developed by two teams of UAH students. The first project was developed for Madison Elementary School, with the ultimate goal of teaching fifth graders about building structures with enough support to withstand an earthquake. For Walnut Grove Elementary School, a waterways model was developed. With this project, the goal was to inspire an interest in the STEM fields among students at the Title I school, and to sustain their interest by making the effort relevant to the rural community that surrounds it. 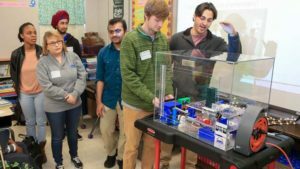 In November, both teams visited their respective schools to present the final product. Both projects were completed on time, within budget, and in accordance with all performance requirements. Read the full article written by UAH here.